Remember which way the wind’s blowing. 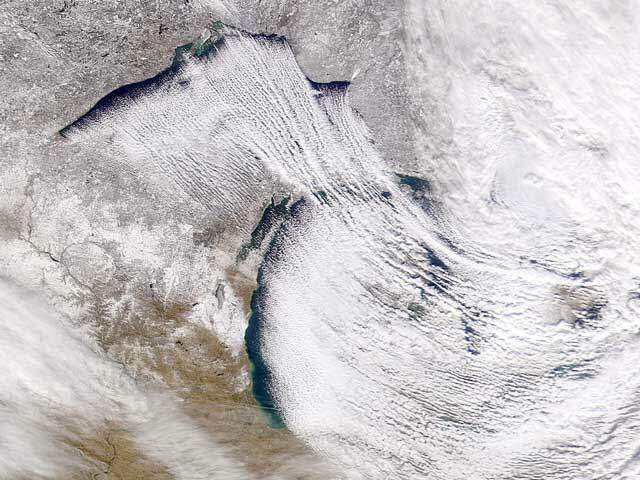 Even if there are blue skies everywhere else, a cold wind will often pull streamers of lake effect weather off the Great Lakes, so if you’re downwind from (say) Lake Ontario or Georgian Bay, expect long streams of clouds with significant icing, snow, and low IFR conditions underneath, topping out somewhere around 6,000-8,000 feet (unless they hit hills like the Adirondacks, in which case the tops can shoot way, way up). This evening, the new photo of the day at Wikipedia (originally from NASA) is a beautiful colour satellite photo of streamers coming off the lakes (click on it for a much larger version), caused by what I’d guess is a low-pressure system centered in northern Quebec a bit east of James Bay. 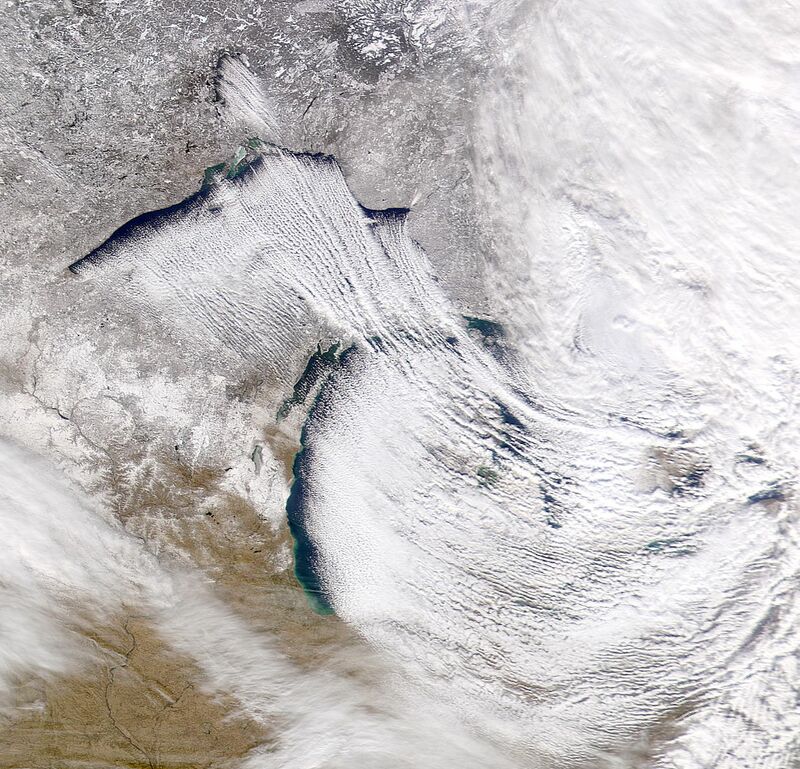 Notice the long fingers reaching out into central Ontario (off Lake Huron and Georgian Bay), Michigan, Ohio, and upstate New York. My normal flying route from Ottawa to Boston or New York takes me across the St. Lawrence River, and depending on the wind, I can usually expect to have to overfly lake effect weather somewhere along my route. If the wind is from the west, I can expect to find it over Watertown, NY and the relatively flat area of NY state, possibly as far as Lake Champlain; if the wind is from the southwest, it will blow straight up the St. Lawrence towards Montreal, possibly boxing in Ottawa as well; if the wind is from the northwest, it will head towards the Adirondacks, and may throw up cloud too high for me to fly over; it will also blow off Georgian Bay across my route from Ottawa to Toronto, so even if the TAFs are CAVU for Ottawa and Toronto, it might be unflyable in between. The trick in every case is to make sure that I can stay above the cloud, because it’s pretty nasty underneath it (not to mention inside). For emergencies, as you can see in the photo, there are usually clear spots between the streams for an emergency descent. If the streamers are over your point of departure or destination, on the other hand, forget about it. People on the U.S. side have it a lot harder in the winter, since the cold winter winds usually come from the northwest and blow over them on the southeast sides of the lakes. Aside from central Ontario near Georgian Bay, the Canadian side is usually clearer. This entry was posted in General and tagged aviating, places, tips, weather. Bookmark the permalink. Thanks so much for sharing that picture ! That is one of the most amazing satellite shots I have ever seen ! Man if only all flight instructors could have images so perfect to demonstrate a certain phenomenan ! Here in Barrie we are stuck between Georgian Bay and Kempenfelt Bay (Lake Simcoe) as well as Lake Ontario to our south. It can make for some interesting weather and can make life difficult when it comes to getting a good day to fly. Oh well C’est la vie! I’ve been to the Cleveland Air Show many times and I’ve often wondered how the pilots keep themselves from getting into trouble with wind direction. But I could not trying to fly through during winter, especially during the lake effect storms.